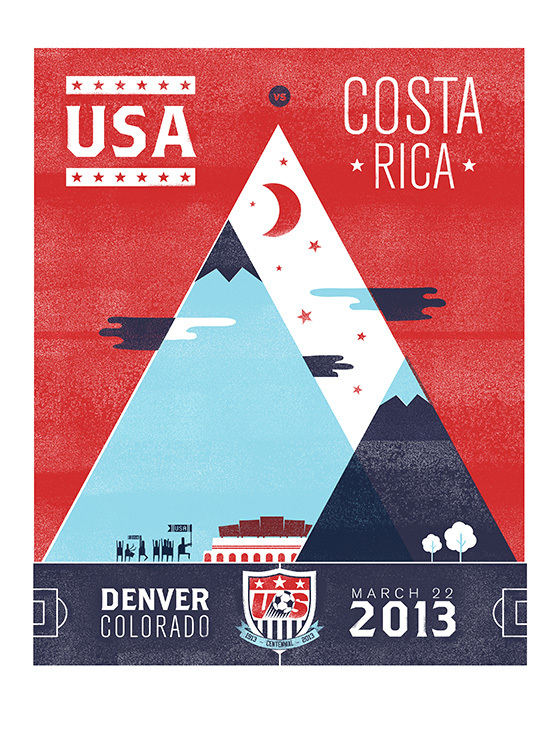 This illustration, for the men’s USA Soccer team, was created to help promote a World Cup Qualifier that is going to be played here in Denver. The US team is going to be taking on Costa Rica. The poster is the first in a series that will be created by local artists, illustrators, and designers in all of the cities holding World Cup Qualifiers. This poster is being silk screen printed by the talented guys over at Indy Ink and looks great. For anyone interested in getting their hands on the poster, some of them will be sold at pep held this Thursday the 21st at the Paramount Theatre, where I will be hanging out and signing posters for whoever buys one (click here for more info) and the rest of the posters will be signed separately and sold as numbered edition at a later date.